Bought it from my local LIDL. Not sure if it is nationwide. 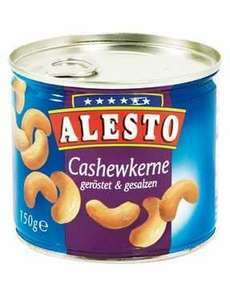 When I was a kid I only saw cashew nuts at Christmas when my dad always had a can of them. We never had them at any other time during the year! Nowadays I buy them all the time and they taste much better when they come out of a can than a bag, don't know why, maybe it just takes me back to Christmas when I was a kid. Cashew nuts are the only edible nut with a poisonous shell. Cashew nuts are the only edible nut with a poisonous shell. There you go, … Cashew nuts are the only edible nut with a poisonous shell. There you go, a sound sleep for you tonight! No more wondering about this :)Oh and hot! It's also true of Brazil nuts. Good point - I'm forgetting my QI. When I was a kid I only saw cashew nuts at Christmas when my dad always … When I was a kid I only saw cashew nuts at Christmas when my dad always had a can of them. We never had them at any other time during the year! Nowadays I buy them all the time and they taste much better when they come out of a can than a bag, don't know why, maybe it just takes me back to Christmas when I was a kid. That was true for roast turkey too. Ah...how do you explain what is nut then in Cadbury "Fruit and Nut"? Or a bag of fruit and nut in a health food shop. Or even nut allergy advice on a packet of food? Why is there no seed allergy advice? By the way I have used a searched engine and found the dictionary definitions of seeds and nuts. These are always 99p in some massive 99p place in Reading. Cashew - Cold. Oh no, it's atishoo - that's a cold! These are nice but extremely salty. just came to say how these are better than the ones in bags as the salt is much finer so not as salty. Yes - the ones in bags must be even worse! Espeons Brazil nuts are not nuts, they are seedsGood point - I'm … Espeons Brazil nuts are not nuts, they are seedsGood point - I'm forgetting my QI. Who cares? They're called nuts so does it matter the specifics of their classification? Who cares? They're called nuts so does it matter the specifics of their … Who cares? They're called nuts so does it matter the specifics of their classification? You are absolutely correct, the critical point in this deal is in the good value eating. The fact it is a nut or seed is best left to wikipedia or a dictionary web site. Heads up: brochure for Thurs 15th-21st November says there will be 250g packets of these for £1.29 (£1 reduction). Might be worth waiting? Heads up: brochure for Thurs 15th-21st November says there will be 250g … Heads up: brochure for Thurs 15th-21st November says there will be 250g packets of these for £1.29 (£1 reduction). Might be worth waiting?